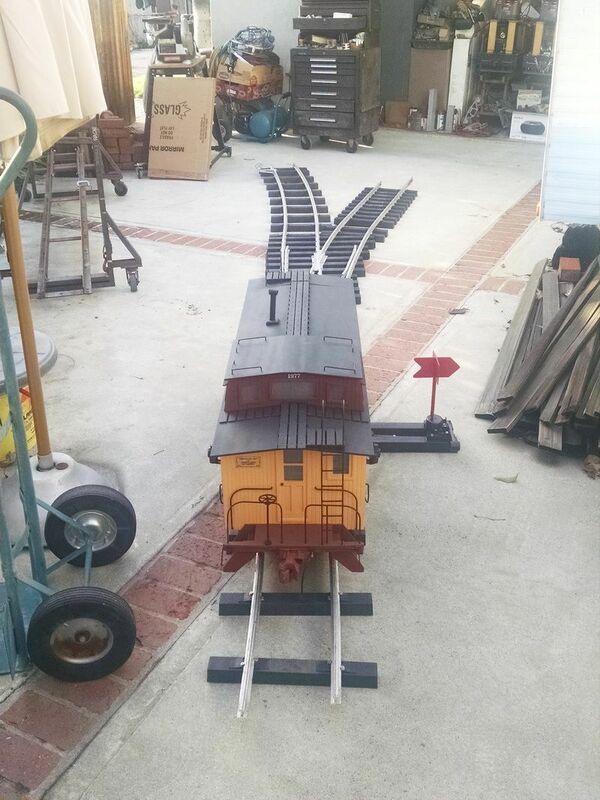 Isn't It is a nice feeling when everything works like it's suppose to..
Looks real nice and will last a long time..
today was a big day here at the shortline. I finally put the new turnout on the ground and ran the first piece of 1/8th scale rollimg stock through the spring points and #5 frog. 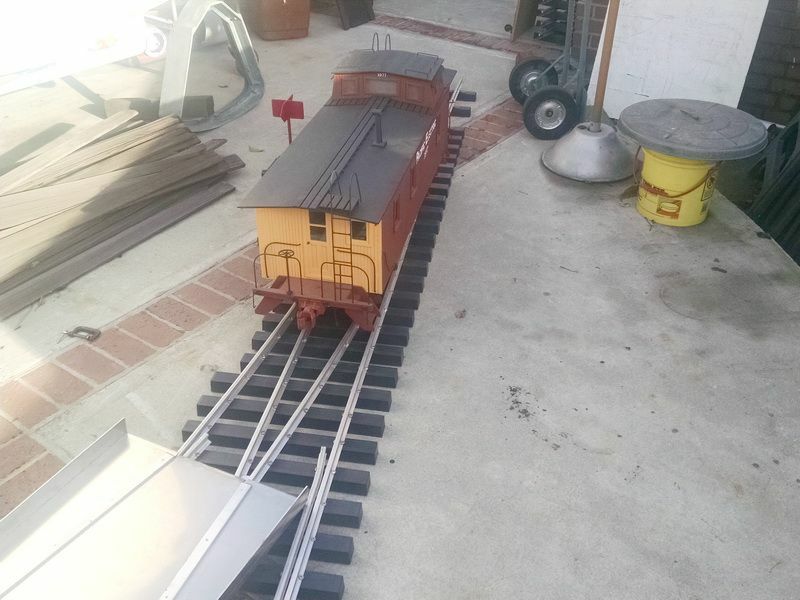 First thing I had to do was move the completed turnout from the locomotive rack it has been stored on and get it on the ground. I wasn't real sure how awkward this switch would be to lift and set in place. 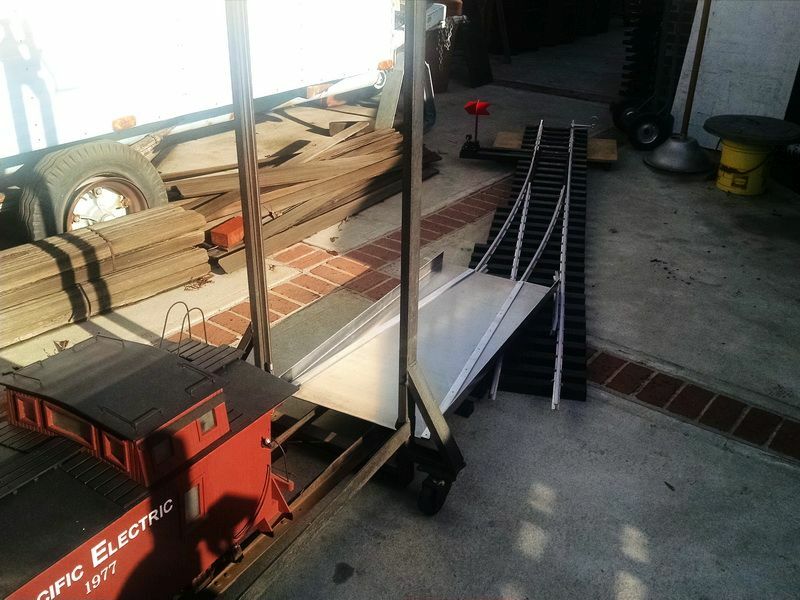 Actually it was pretty easy to put part of the turnout on my locomotive/rolling stock lift rack, get it balanced and then just lower it down. A lot easier than I thought.......at the end of the day, I was just lifting and carrying by hand to move into place. This switch is very sturdy and there is no flexing or bending anywhere. 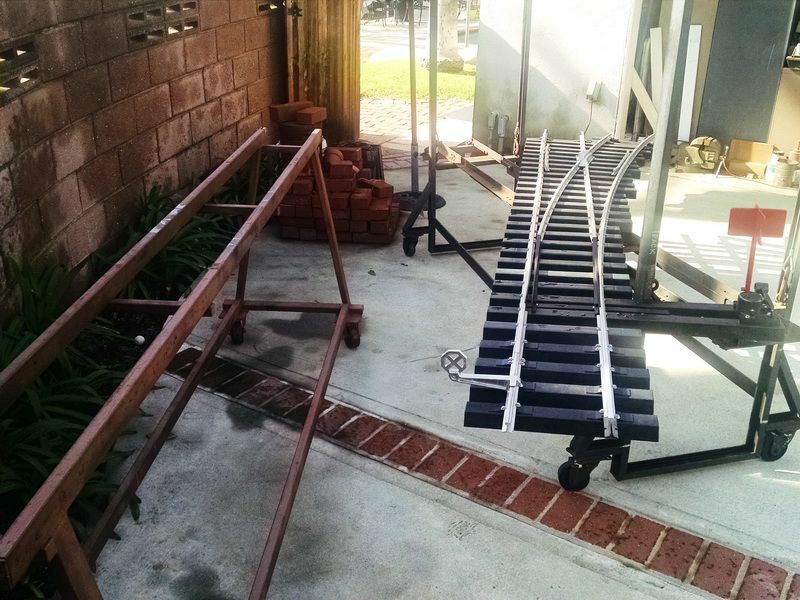 Next step was to pull a piece of rolling stock out of storage and place on the track and turnout. 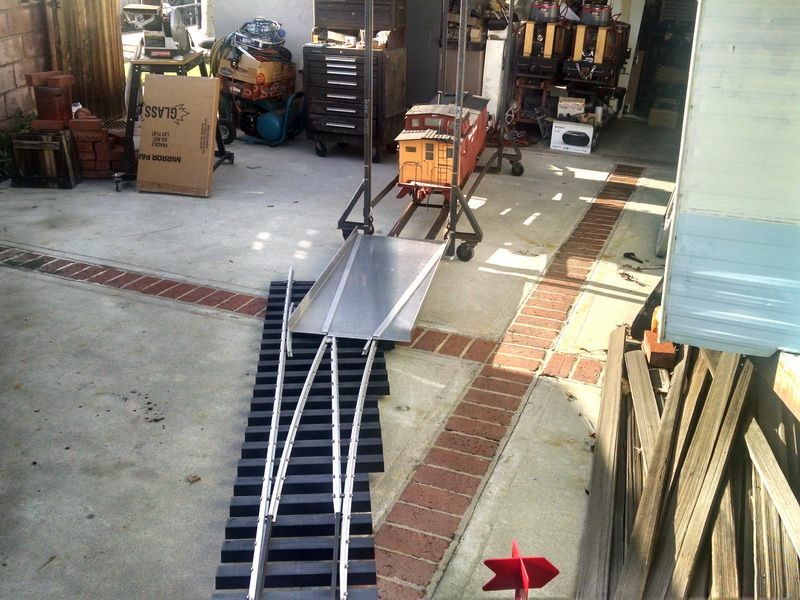 This method worked great with the aluminum loading ramp I purchased a couple of years ago from the Big Boots & Western RR in Florida. 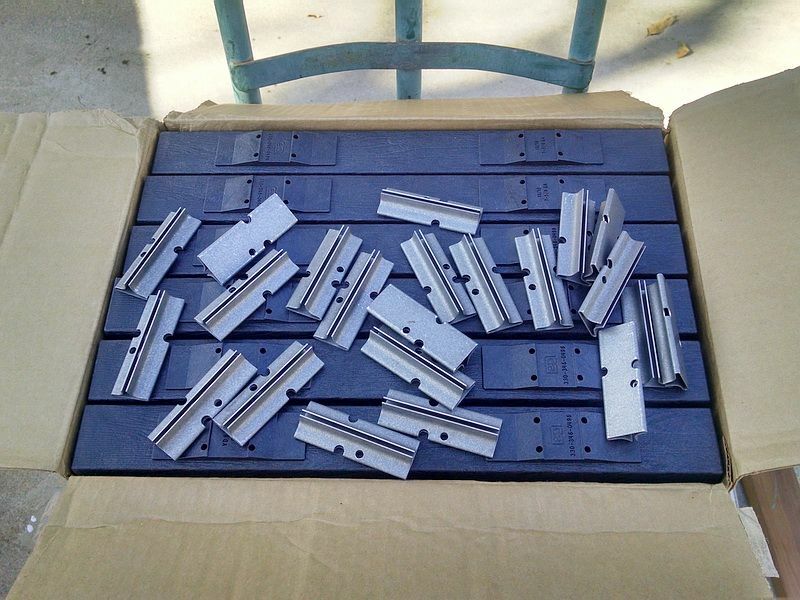 Made of 1/8th thick aircraft 6061 T5 aluminum plate. 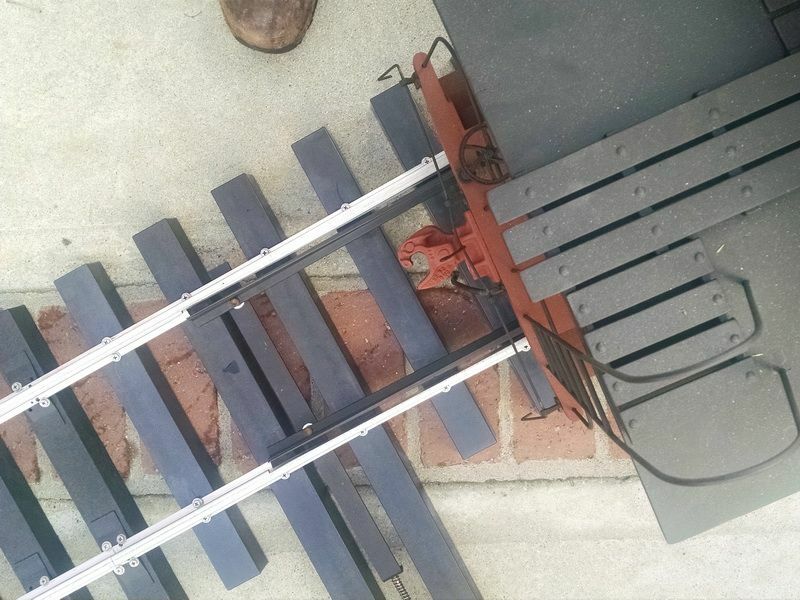 This ramp/rerailer is capable of holding locomotives up to 800 pounds. Very strong, but lightweight. My caboose is the lightest car I own at 125-130 pounds. The caboose rolled right off the lift rack and right onto the switch tail track rails.....no derailments. 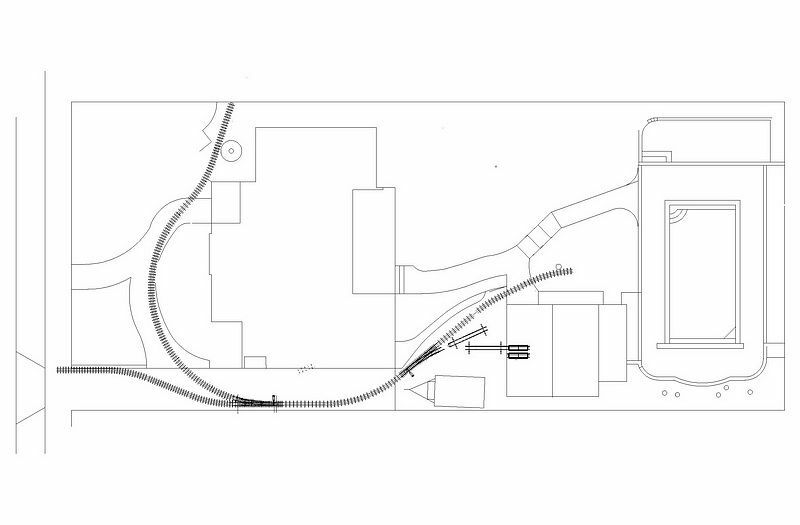 The tapered "rails" worked just as advertised by quiding the trucks right in the proper position. I had been skeptical, but it worked great. Another view of the operation. First time on the rails! First test of the spring switch points! Because this is the lightest car, I wasn't sure if I had the springs adjust correctly on the switch throw. But as you can see in this photo, the wheels are moving the points and no derailments. Very smooth going through these points. First test of the caboose trucks through the cast aluminum #5 frog. Smooth as glass. 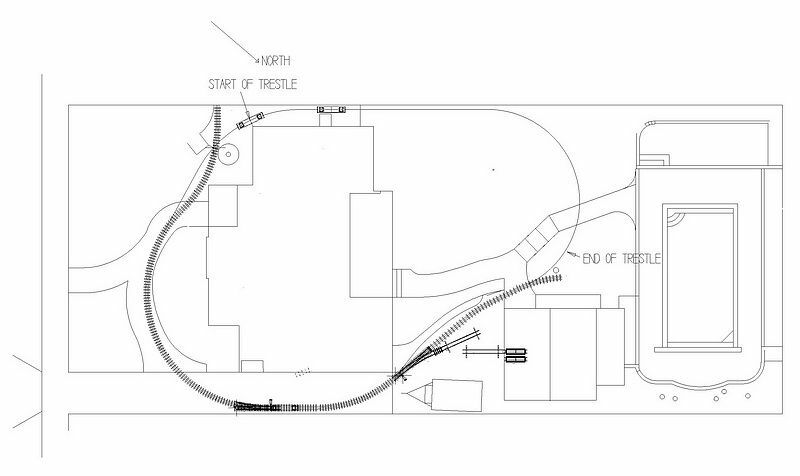 The new turnout is approved and ready to be installed on the shorftline. 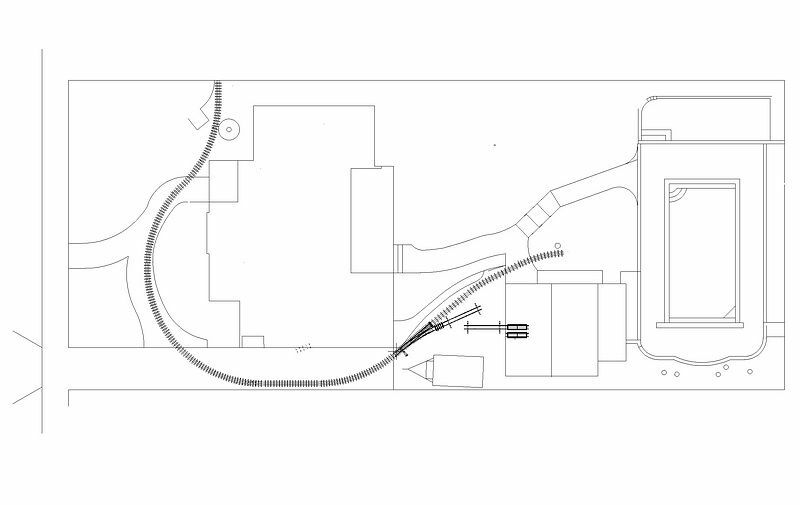 I can't wait to get delivery of my second #5 turnout "kit" to be installed about 150 feet up the driveway for the "station" and siding for multi train/bi-directional running. The rain stayed away today to get this testing finished. This finally completes the #5 turnout "build". Thanks for looking :). You must have a really big pair of pliers to tighten those joiners! 10 inch Vise grips John :). Actually they slip together easier than the small scale joiners. Already in place of one track panel. Then just "slide" the adjoining panel on. Note the photo above with the large furniture clamps (Sean's post). Both of you (Sean and Ken) are correct about the rail joiners. They are no more than "giant" LGB rail joiners :). 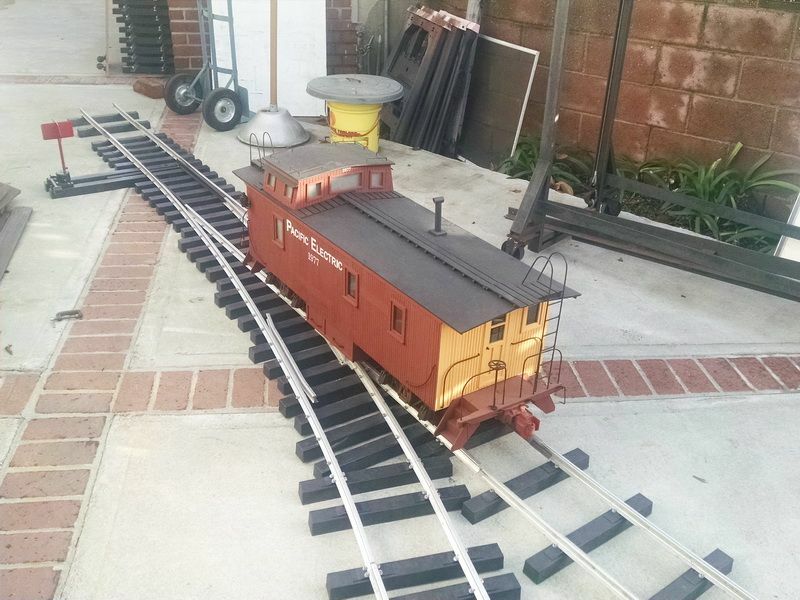 The ones I use are called "Train Mountain" joiners, used to connect track panels at the world renown 7.5 inch gauge layout in Oregon. 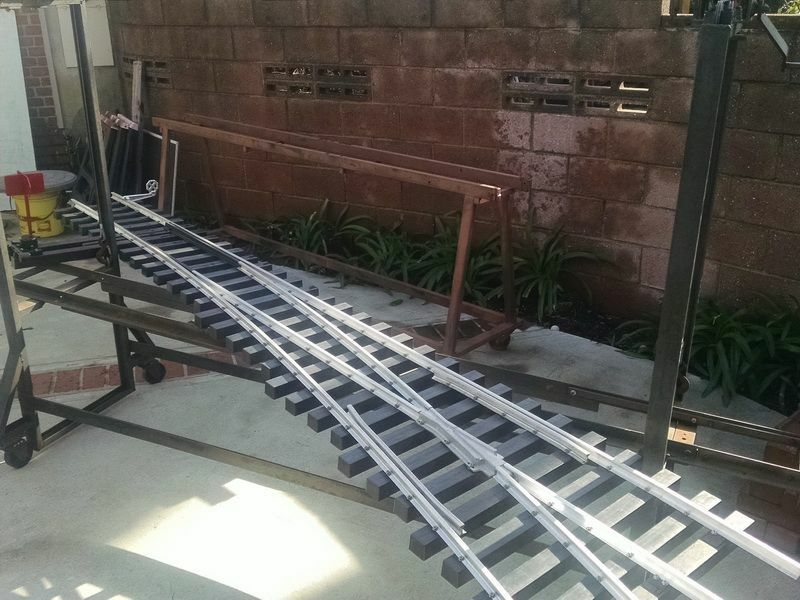 L.A. Live Steamers still uses "fishplates" like the prototype. But for a home layout that is semi-portable (temporary set-up), these TM joiners seem to work great. 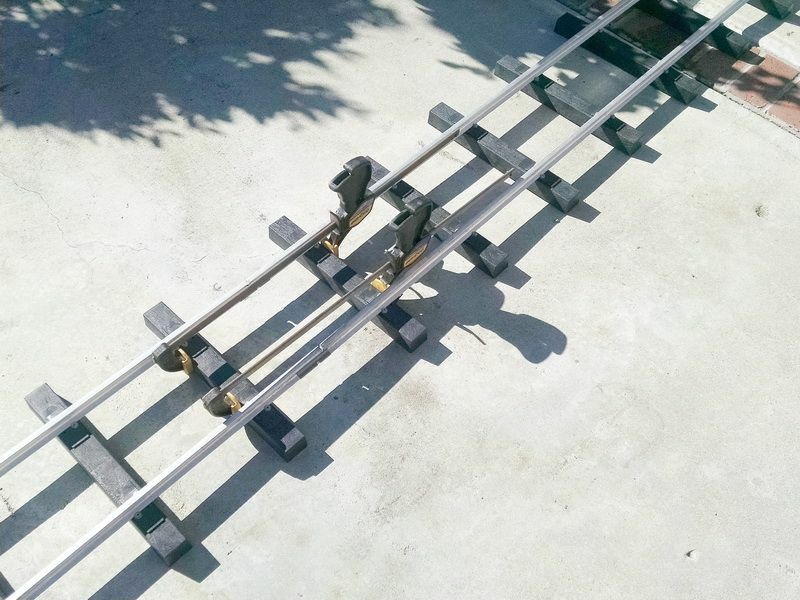 Each track panel weighs about 25 pounds (with the "tie configuration" I use), so using these "slide-on" joiners makes it much easier to put the layout together in a "one-person" operation. I'll try to find some photos of these and add to this post. 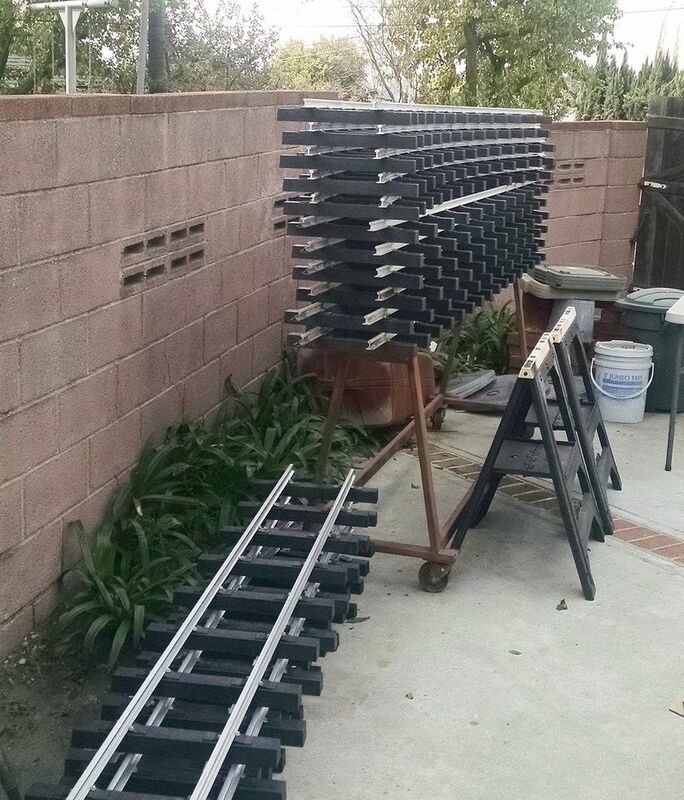 EDIT: I found a couple of photos of the Train Mountain rail joiners I use on these track panels. As you can see in this photo, there are two "notches" and one hole in each joiner (these are 4 inches long and a little over 1 inch wide). The single hole is used if you want to permanently mount the joiner to the end of the Code 1000 aluminum rail. The two notches are used as "temporary" holding to keep the panels from sliding apart in train use. So far, I have found I didn't need to do this. The panels are heavy enough that this slippage doesn't occur. 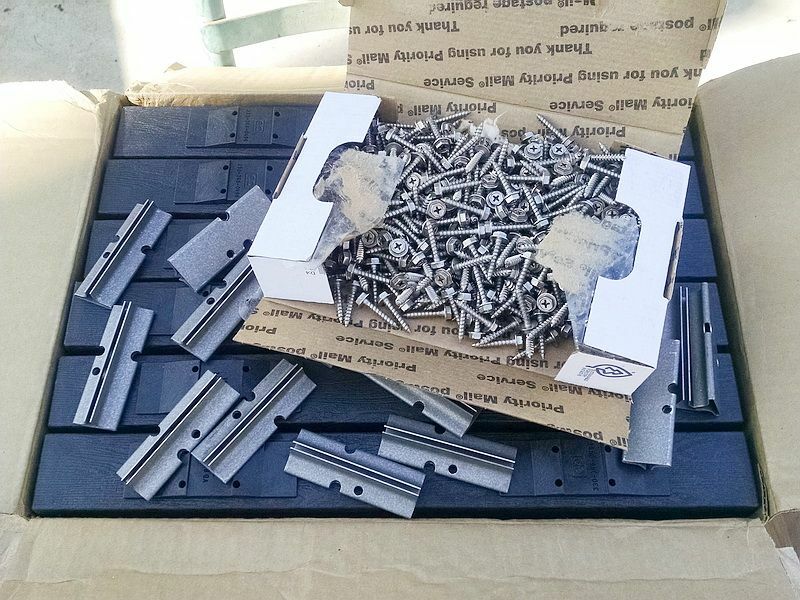 These are the SS screws used to fasten rail to the ties. #10 X 1-1/8 inches long. These screws also fit the single hole in the joiners and the notches. Ken it looks like a larger version of our rail joiners .. hard to see if they used screws ..
How are those track panels tied together? With rail joiners like the smaller gauges or bolted together like the full size RR's?